My husband is a mechanic, and could have been an engineer if he had wanted to; he thinks in physics-speak. His brain soaks up all things electronics, and he has been waiting for Alyssa to be old enough to get an electronics learning station and go over all things electronics with her. The stations costs like $60 brand new, so I've been on the hunt for a good sale. A few weeks ago we made the rounds ("adventuring") to a few garage sales with the kiddos and stumbled upon a garage sale hosted by a guy with a similar electronics bug. And voila!, 3 electronics learning stations, each marked $3. The guy said they were each missing a few parts, so he sold all 3 to us for $3! I cannot say enough how much I heart garage sales!! I never knew these things existed, but they are pretty neat! I'm pretty excited that my daughters will know how to operate a DVOM (digital volt and ohm meter) at a young age and get a head start on physics while spending super-quality time with Daddy!! I Was Nominated for the Liebster Award!! Thank you so much to Melissa at Adventures with Captain Destructo for nominating me for this award! I really appreciate it. Her blog is super awesome, too!! I was so shy as a little kid that I could hardly talk sometimes, and I'm still pretty shy around new people. I am super proud of the fact that I got to mosh with my husband at my wedding reception. I LOVE salads, but don't like lettuce on sandwiches; I even order BLTs minus the L.
I would LOVE to be on Wheel of Fortune, but fear I am only good at the game from my own house (see #1). I play fantasy football and generally know more about sports than my husband. I draw a blank for a super long time when asked for 11 random facts about myself. This part is taking me WAY too long to complete! I played baseball with the boys as a kid, never softball. I have an obsession with tomatoes and eat them nearly every day. I have a master's degree in biology. I have a pet peeve about grammar and I'm always finding typos in advertisements and books. I had an aversion to pink until I had a daughter (and then another one!) and now I tolerate having pink things in the house. I am nominating the following wonderful blogs for this award. What is your favorite food? Pizza and Ice Cream run neck and neck. What did you want to be when you were a little kid? A doctor. I love science and before college, I didn't realize how many ways you could use a science education. What was your favorite book as a kid? The Boxcar Children. I can't wait to read that with my girls! What season is your favorite? Spring, because I love the nice weather and anticipation of fun summer activities, but I like many things about all of them. What is your favorite holiday? Now that I have two little ones, Christmas. I love watching them be so excited about it and getting together with family. If you could have one day to do anything, what would it be? I would love more time with all of my family doing something fun together. Owning businesses is not always conducive to dedicated family time with both me and the hubby. Which chore would you rather do, dust, grocery shop, or laundry? Definitely laundry. There is something soothing to me about the orderly folding and putting away of clean clothes or linens. How many kids did you think you would have as a child? Two. And I was convinced I'd name them Christian and Shelby. How silly was it to be so convinced I'd like those names as an adult?? What do you look forward to most about fall? Now that summer is winding down, I look forward to the weather getting cold enough for a fire in the wood stove. Does the scope of subject matter and target audience of your blog today match what you envisioned when you started? Is form or function more important to you? If you use a smartphone, what app can you not live without? Would you rather have a maid, a personal chef, or a gardener? What is the most organized room in your house? What qualities of you do you see in your children? Thank You - 10,000 page views!! I want to say a quick THANK YOU to all of my readers and followers! My blog has grown so much in the past few weeks and I am blown away and giddy about it! At the New Year, I made what I thought was a lofty goal of hitting 10,000 page-views by the end of 2012, and thanks to all of you, I have just passed that milestone several months early!! Here's to hoping I can hit 20,000 by the end of the year now!! I decided I wanted to do something fun with the paint for this project and decided to try some polk-a-dots. 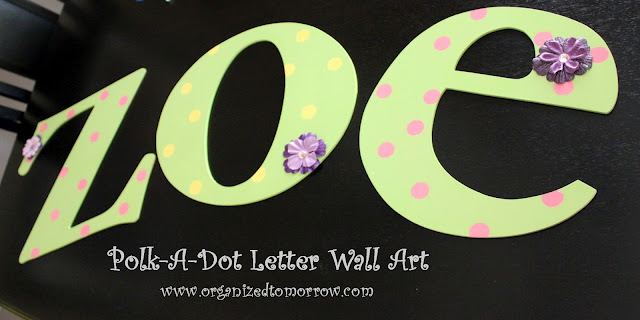 First, I painted the letters the polk-a-dot color: pink for the Z and E and yellow for the O. After that paint dried, I used pennies from our coin jar to make the polk-a-dots. I set them out on the letters in a random pattern and painted all 3 letters with green (all the paint was spray paint). After about 20 minutes, I very carefully used my Cricut pick tool (looks like a dentist's pick) to pick up all the pennies and then let then let them set so the paint dried completely. Then I added a little something extra by hot-gluing some fabric flowers and rhinestones onto each letter (which also allowed me to bring in the other colors from the room). I think they look super cute against the lavender walls and this was a very budget friendly project!! Now the girls each have their name represented on the walls of their shared room. Pretty soon I'll show you how the "final" room came together! 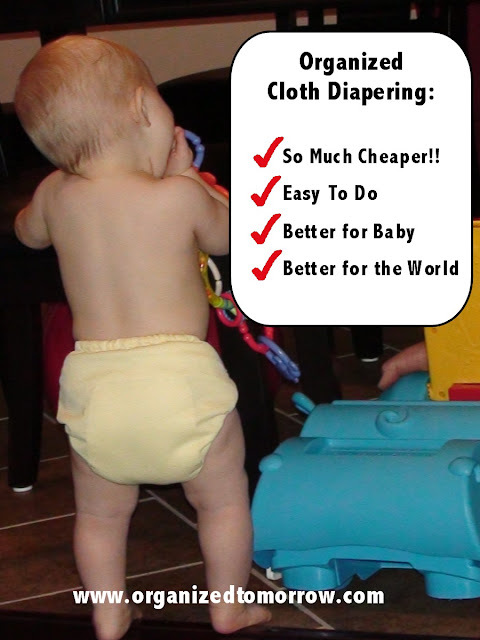 Now that I've discussed how and why we chose cloth diapers, as well as some basics of starting with cloth diapers in Organized Diapering Part 1, I'll get to the details of our system for cloth diapering today. We use the Tiny Tush Elite One-Size diapers, each of which comes with a water-proof diaper cover, a small (infant) insert, and a longer (large) insert. The tips listed here apply to these diapers, but they may apply to other types/brands of diapers as well. We have a total of 28 diapers now, and daughter # 2 is going on 15 months of use. 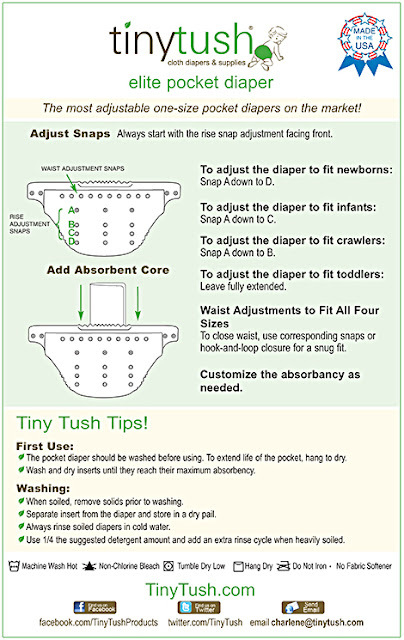 When baby is tiny, use the small insert and snap the sizing snaps (3 rows of snaps along the front of the diaper cover) to the bottom row to fit your little one. Move up to the next row when the diapers start to get a little tight. Below is the diagram of how the snaps are laid out on the Tiny Tush diapers we use. Of course I didn't pay too much attention to the point at which this next transition took place, but somewhere around when we started solid food I think, we started using BOTH the small and large inserts in each diaper. We continue this way until baby is potty trained. This has always worked best to prevent leaks, especially at night. Come to think of it, the transition may have been around the time she started sleeping through the night, about 3 or 4 months old. We use the plainest of plain cotton baby washcloths for our wipes. The flushing bottle I got for self-care after delivery of daughter # 1 makes the perfect water bottle for the diaper station. Just squirt a little water on a clean wash cloth and you have the most gentle, chemical-free wipe you could expect! Just toss them in the wash with the diapers and re-use! Two things about this are worth mentioning. We purchased baby washcloths with a wrapped edge for use in the kitchen to distinguish the washcloths in case one is found laying around the house. Because even though the ones used for wipes are clean, it still feels better to keep them segregated. Second, because we use plain water on our wipes, sometimes baby's bottom is a little wet after cleaning. Most of the time a little fanning with the clean diaper is all you need to dry the bottom, but sometimes it doesn't happen fast enough. For this purpose we also keep a roll of Viva paper towels at the changing station. Viva are by far the softest paper towels, and this works better then another washcloth for getting baby very dry before a clean diaper. Part of the system we have for diapering has to do with our diaper changing station. We try to replicate as much of the system as possible in the diaper bag for easy changing on the go. At home, we use a wire basket to wrangle all the cloth wipes, water bottles, paper towels, and coconut oil (more on this in a few minutes) and keep them within reach. Maybe I'm nuts, but I have never once used the straps to strap down either of my children to the changing pad. I understand the manufacturer is required to put the straps there, but they just sit underneath our changing pad. BUT, the changing pad is a little slick, and since we just set ours on top of the normal dresser in the nursery, I use the bumpy shelf liner/rug pad material cut to the size of the changing pad to make it stay put. It works like a dream!! In the diaper bag, we use a large Planet Wise wet bag I got at my local Eco in Chico to keep all the soiled diapers until they can be "dealt with" and put in the diaper pail at home. The bag can be washed and dried and is just awesome! Once you are past the meconium stage, but before solids, you don't really even need to do anything but toss the diapers in the wash after baby poops. As soon as the poop gets a more solid consistency, or there are chunks of solid food, the poop should be disposed of in the toilet prior to washing. We keep our diaper pail in a bathroom and take the diapers straight there after changing, eliminate any poop in the toilet and toss the diaper and wipes in the pail until the pail is full. With our 28 diapers, as soon as the pail is full, it is time to wash diapers to ensure we always have plenty of clean, dry diapers at the ready. They make sprayers that you can hang near the toilet and tap into the toilet's water source to spray the diapers out, but I've never found much more than a couple of repeated dunks in the toilet water necessary to remove the chunks enough for washing. The sprayer seems like it would be a magnet for toddler play and mess-making more than a useful cleaning tool, but to each his own. I have never tried it. It has never bothered me to get my child's poop on my hands during this process and then wash my hands well after the diaper goes in the diaper pail. As an alternative, a pair of rubber kitchen gloves dedicated to this purpose work quite well for my mother-in-law, who watches my daughters regularly. The diaper pail lives next to the toilet in the guest bathroom. In a complete stroke of luck, as soon as the 8 gallon diaper pail we use is full, it is time to wash diapers to ensure we always have plenty of clean, dry diapers at the ready. If I wait until it is completely overflowing, or I have a separate bag full in addition to a full diaper pail, I am in danger of running out of diapers before the load is clean and dry. A normal wash cycle consists of a cold-water rinse, followed by a hot water wash. Since my tank-less hot water heater allows me to select the hot water temperature (as I have mentioned before), I am able to wash my diapers in 140 degree F water and then turn the water heater down for baths (which I love!). No soap or anything for the first rinse, and I use a full scoop (which I'd estimate to be 2 Tablespoons) of Charlie's Soap for each wash-load, although the diaper manufacturer says you can use less soap with good results. Although not directed by the diaper manufacturer, I also fill the fabric softener dispenser in my washer with white vinegar and then add an extra rinse to every cycle. I'll go over the reasons that this has been an awesome addition to our system with daughter #2 in the next section. When the diapers are brand new, it is best to put them through 2 full rinse and wash cycles to help the inserts gain absorbency and get them ready for baby. After washing, I hang the diapers and wipes on the dry rack to dry. The inserts CAN go in the dryer, but they maintain their absorbency much better when they air dry. Here in the Northern California foothills, during the hot part of summer, the diapers will dry in a few hours outside in the sun. Likewise, in the cold part of winter, the diapers will dry in a few hours hanging by the wood stove. During the spring and fall, they can take a little longer to dry, maybe a whole day, unless they can sit in a room under a ceiling fan on high. For reasons explained in the next paragraph, I let mine dry outside whenever the weather permits. When I put the diapers together after they dry (I like them to be ready to throw on baby), I always orient the inserts the same way, positioning the tags at one end of the inserts to face each other, with the large insert on the outside of the diaper cover (closest to baby's bottom). That way any staining that may occur from poop is always on the same side of the longer inserts, and I just hang them with that one side facing up in the sunshine to let the sun fight the stains, since you can't use bleach or any other chemical stain remover with the diapers. I must say the sun is a pretty amazing stain-fighter! Cloth diapers and traditional diaper creams do not get along. Although they say with the gentleness of cloth diapers, diaper rash is less common with cloth diapers, I say diaper rashes will happen no matter what. It is imperative that diaper creams aren't used without a barrier between the cream and the cloth diaper. Diaper liners are sold by most of the cloth diaper manufacturers. They provide a sufficient barrier to use diaper cream and protect the cloth diapers. As an aside, they can also make poop clean-up easier, if you just can't get past that part. 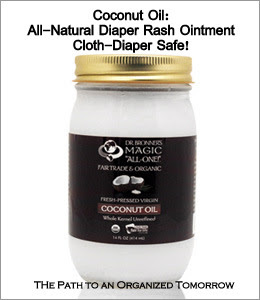 We have used a couple rolls of liners only when baby has diaper rash, but more recently we have discovered the use of coconut oil (we like Dr. Bronner's brand) to combat diaper rash. The rash seems to clear up just as quickly as with traditional diaper creams, but the coconut oil doesn't harm the cloth diapers in any way! So this would definitely be my suggestion!! We put some coconut oil in a re-purposed baby food jar for travel and keep a jar at the diaper station. Run the diapers through a rinse cycle like normal. Wash the diapers in hot water (should be ~140 degrees F if possible) with 1/4 cup dish soap (I use Ajax lemon - I'm told the stripping may not work as well with an all natural dish liquid; you want that strong degreasing capability). Run a rinse cycle with 1/4 cup to 1 cup of white vinegar. Run two more rinse cycles with nothing added to rinse the diapers thoroughly. Air dry and use as normal. In the case of visible diaper cream remaining on a diaper cover, you may need to scrub the diaper with a bathroom tile scrubber and dish soap until you can't see the diaper cream anymore. Then run through the stripping process. This is why it is better not to use traditional diaper creams without at least a liner, but I had a few diapers that were like this after daughter #1, and I cleaned them in this manner and have used them for daughter #2 with no leaks or problems. The addition of vinegar to the rinse cycle of every wash-load has made a big difference in the frequency with which I have had to "strip" the diapers with daughter #2 (and the SAME set of diapers!). That is to say I've stripped them only once, at about 11 months. Surviving Summer Pot Lucks: Grilled Veggies!! The summer months bring with them plenty of gatherings that challenge my willpower to stick with a healthy diet. Pot lucks are fraught with a tempting selection of chips and dips, high-carb salads with potatoes or pasta, and sweets galore. This year, I've managed to get through several parties without indulging by bringing a medley of grilled veggies each time. Paired with some grilled chicken or tri-tip and a nice green salad, we avoid temptation by avoiding hunger. To make this particular batch, we cut up a selection of veggies including bell peppers, onions, zucchini, yellow squash, and mushrooms. Any combination of veggies you like will do! In a large bowl, we toss the cut veggies with some grapeseed oil, crushed garlic, salt, and pepper. For this batch, my husband tossed in some sunflower seeds as well - yummy! We use this grilling basket on the BBQ to grill the veggies. My husband usually takes care of the grilling, so I got these details from him. He starts with them on a hot flame, stirring to sear the edges. After the veggies sear, he turns the flame down so the temperature comes down to ~400 degrees F. He adds a layer of tin foil under the grilling basket to catch the juices and achieve a steaming effect by cooking them with the grill closed until they are done (for this batch it was another 30 - 40 minutes, but would depend on the grill and the size of the batch, of course). When taking these to a pot luck, we grill the veggies ahead of time, then keep them warm by making a foil packet big enough to contain all the veggies after they're cooked. We put the foil packet full of veggies inside a small baking sheet. When we arrive at the party, we can reheat the veggies if necessary, open the packet, and add a serving spoon. Super easy, soooo yummy, and wonderfully healthy! How do you stick with your healthy eating plan away from home?? Pinterest is great for all kinds of inspiration. As incentive for me to actually put some of these great ideas into practice, I'll post about things I've replicated or modified from something pinned on one of my Pinterest boards. We are in the middle of a stretch of summer here in Northern California where some afternoons are just too hot to go outside. And with several wildfires burning in the area, the mornings are super-smoky. That makes for a long day inside for my daughters - currently 15 months and almost 4 years old. Boredom leads to many timeouts in my house, so I love Pinterest for boredom-busting ideas. I was thinking this no-mess art project idea would be perfect for my 15 month old, who loves to finger paint. Finger paints are sealed in a baggie and attached to a sliding glass door at a convenient height for toddler play. With the light from outside coming through, the colors are brighter and you can really see when you write or draw shapes in the paint, but I'm sure it would work if they were attached to a wall or table-top also. In reality, my 15 month old Zoe just wanted to rip the baggie off the sliding glass door and check it out. But the almost 4-year old loved it, so I moved both bags high enough on the window for Alyssa. It is still entertaining for Zoe because she enjoys watching her sister. I squirted paint from several different colors into two quart-sized Zip Lock bags, sealed them up and taped them to the inside of the sliding glass door. I left them up on the window after the girls lost interest that day to see how long they might last. I took this picture after 17 days on the window, and while all the colors have mixed together, they still work for finger painting and drawing letters or shapes (in fact they are still there today!)! What simple, mess-free activities do you have in your boredom-busting arsenal?